Increase your success of our Free Sticker Program by adding a Tile Wall to the fundraiser! Not only do you receive all the benefits of the Free Sticker Program but you can offer your families the ability to purchase a ceramic school tile of their child’s artwork to be displayed in the beautification project at the school! 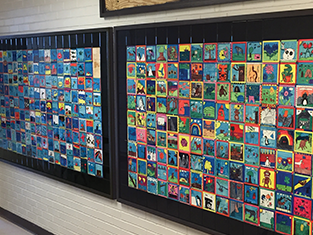 An indoor tile wall mural is a perfect way to create a legacy gift and beautify your school! Our tiles are not kiln fired and are not appropriate for outdoor installation. Create colorful artwork on the FREE art paper we provide in your Toolbox. Lesson plans available! Label & organize art by class in the folders provided. Easily distribute the Custom Ordering Catalogs that are pre-assembled individually by class/student (make sure your order phase is not competing with other events at the school). We offer a price range from $7 to $45 to meet the budgets of all families. 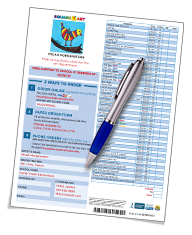 Three easy order options for all families: online, phone, or with the paper order form. 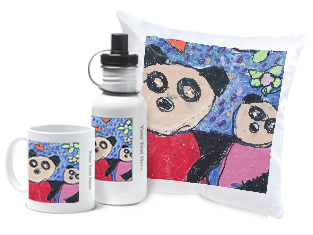 Your pre-scheduled delivery window makes it easy to plan ahead for receipt of your keepsakes. Our staff manufactures your quality keepsakes in our own facility in only 7 days ! Keepsakes are delivered to the school organized by class/student for easy distribution. Your school Tiles are shipped in their own box for your installer. Profit check and statement are mailed shortly after products arrive at your school! Earn up to 38% of your total sales. Click below to find out how! !